So the Hub released the above photo on their Facebook page with the caption "The LPS crew giving Jem and the Holograms a run for their money!" Well I see Minka's resemblance to Jem, and Penny's resemblance to Shana Elmsford, but I don't see the resemblance in the rest of them. Also, how does 80's makeup and outfits relate to tomorrow's episode?? Only one way to find out! Episode 19 airs at 11:30am ET / 8:30am PT! Nice touch of 80's for pets...I guess pets look cool in everything. As that Jem and the Holograms parody? Now I am really excited. I thought that was a reference to Twilight's My Brother song from "The Royal Wedding" and the "It's Okay" song from Friendship Is Witchcraft But okay. I'm starting to become convinced that a majority of the adults who watch this show are fans of Friendship is Witchcraft. 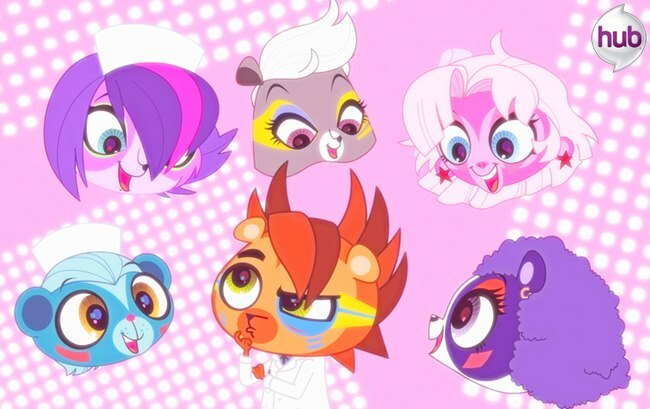 Looks like this is going to a Totally Outragiosue episode of Littlest Pet Shop. Something about Russel's facepaint makes me think of David Lee Roth in the Yankee Rose video. "Give me a bottle of anything....And a glazed donut......To Goooooo!" But more often than not this'll be a Jem parody, if not just 80s in general. Better break out the CFC depleting hair spray. Well this week's episode was Truely Outragious, Truely Truely Truely Outragious, who gets the reference? Anywho this is great episodes despite the not telling us why Blythe can talk to animals. I loved the Humanerim song, according to the Hub's Facebook page it was suppose to a tribute to Jem and the Holograms, the ending it reminded of Twilight Sparkle's My Brother from the "Royal Wedding", and tell me who didn't think of this when they saw the end "Twilight please let this song end we're a bunch of floating heads". Ha ha. I liked how Blythe has developped that she really treassures her abilities, she has come a long way from the first episode. As for the Vinnie plot, well the fly reminds of Zipper from Rescue Rangers, in a show full of talking animals, he doesn't talk, just like those birds and even those mean dogs, what is up with that? And that little girl she reminds of Elmyra, someone made fan art of Blythe confronting Elmyra, so just switch it to this girl. Some people shouldn't have pets, and on the subject maybe her mother is someone who shouldn't have children. I loved the rat, he is awesome. I hope to see him again, he could be a good allie in the future. As much as I really did enjoy this episode overall (especially Vinnie's subplot), I feel this may be a base breaker because people expected to learn more about Blythe's secret and how she has this capability to speak to her pets... While not a huge deal, I feel this must be addressed sooner or later to appease the masses. Otherwise, this show can keep up the good work, even though next week's conflict with the Biskits will probably have a tough time following this act, IMHO(all I care about is if the pets can have a prominent role in this contest...). "Russel please make this song end, we're a bunch of floating heads"